This entry was posted on Tuesday, September 5th, 2017 at 9:18 am	and is filed under Books, Hotels, Museums	. You can follow any responses to this entry through the RSS 2.0 feed. You can leave a response, or trackback from your own site. My first job out of the Parsons school of design, was at a medium sized advertising agency called Sackheim. They had some huge international accounts. Their offices happened to be located inside the beautiful Plaza Hotel. When we worked late, they told us to order room service. It was always elegantly served in sterling silver and was about $15 for a pot of coffee. And that was back in the mid 60s. Well one day this British rock band, called the Beatles, came to stay at the Plaza Hotel. Naturally it was swamped outside with teenage girls. We all had to be issued special passes… just to get into the hotel. There was a rumor that the Beatles reserved three entire floors but only lived in the middle one, to avoid any encounters with non-Beatle type folk. I was working there at another memorable moment in time… John F Kennedy’s assassination! Lots of memories. Few can beat your memories of the Plaza Hotel! Mine are mundane and ho-hum by comparison but reading yours triggered this one: I was waiting for someone near the front entrance years ago when a huge man surrounded by others walked by, swinging a camel hair coat over his shoulders. It was Donald Trump. 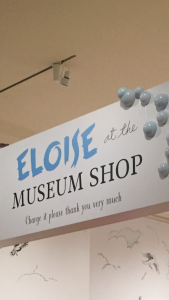 No question about Eloise being a mega-brat backed by healthy financial resources. But, unlike Dennis the Menace, she’s a bright and resourceful one, so she’s worth an A++! 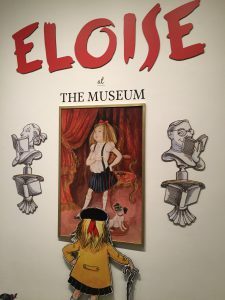 I also loved the Madeline exhibit at the New York Historical Society a few years ago. She wasn’t bratty, but I never tired of her as a character. I love the book and have also shared it with many children over the years. I always think of the book Eloise herself as an adorable although indulged fictional friend and of “Eloise” the book with fond feelings of nostalgia for childhood memories of things real and imagined. 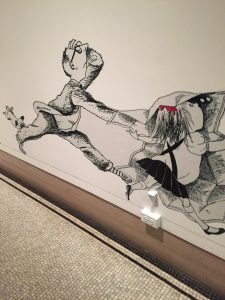 The illustrations are absolutely essential to the charm and mystique of the book and at least as much responsible for its enduring charm as the protagonist and her story. It is terribly disheartening to learn about Kay Thompson’s distinctly unappealing character although it does sound less unusual today than it might have even a short time ago. I am not a New Yorker, but thought of the hotel as a legendary and beautiful place with an air of gentility until its acquisition by Donald Trump, which seems to me was a point of no return. I forgot to add that I hope to see the exhibit! 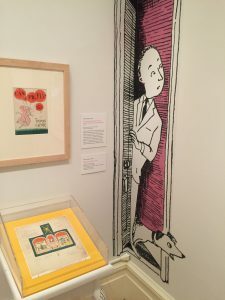 I agree about the illustrations–it is Hilary Knight’s interpretation of Eloise that we remember while with another favorite series–the Madeline books–while I can envision Ludwig Bemelmans’ wonderful illustrations, I also remember some of the lines–“Miss Clavel turned on the light and said, ‘Something is not right!” etc. Kay Thompson was talented–an actor, a writer–and I wish she hadn’t been nasty but that bit of acid may have made Eloise such a memorable character. Unfortunattly, Ms. Thompson was–and is–not alone. The meek won’t inherit the earth.